B and I try to eat fish a least once a week, but coming up with different recipes always seems to be a challenge, more so with fish than other proteins. Luckily grilling season always provides us with a chance to switch things up a bit. 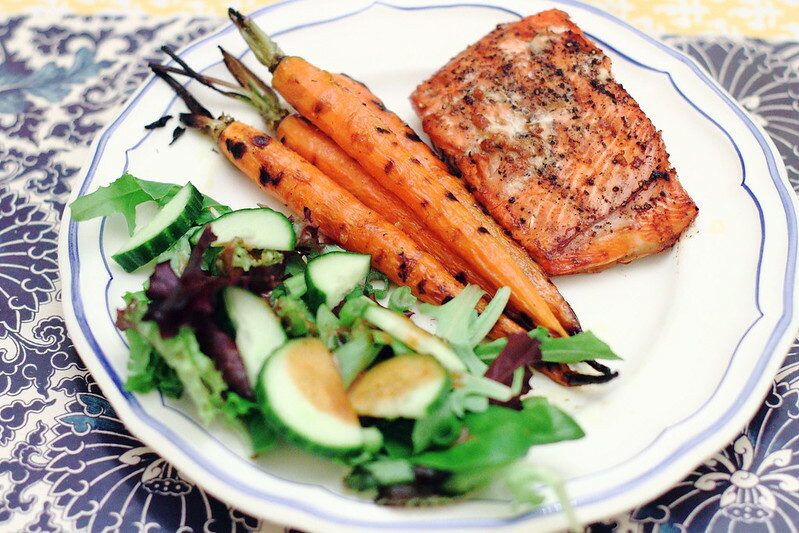 A helpful tip we recently learned: don’t marinate salmon for more than 30 minutes or it becomes mushy. Also, make sure to oil the grate or the fish will stick. This recipe goes well with a spicy carrot recipe we adapted for the grill from Mario Batali’s America: Farm to Table cookbook. Combine last five ingredients and salt and pepper to taste. Reserve 2 tablespoons of marinade and set aside for a glaze. Place salmon in marinade, flesh side down, keeping skin out of the marinade. Cover and let marinade for no more than 30 minutes. Heat the grill to medium-high heat on one side and low heat on the other. Wipe the grate liberally with vegetable oil. Remove the salmon from the marinade and season the flesh with pepper. Place the fillets flesh side down on the hotter side of the grill at a 45 degree angle and cool until grill-marked (about 1 minute). Flip the fillets to skin side down (still on hotter side of grill). Brush the flesh side with the reserved glaze. Cook until the salmon is opaque about halfway up the thickness of the fillets (about 3-4 minutes). Brush the flesh again with the glaze, then turn the fillets flesh-side down onto the cooler side of the grill. Cook until deeply-browned crust has formed and center of the fillet is translucent when you cut into it (about 1-2 minutes). Transfer fillets to a platter, brush again with glaze, and serve with lemon wedges. 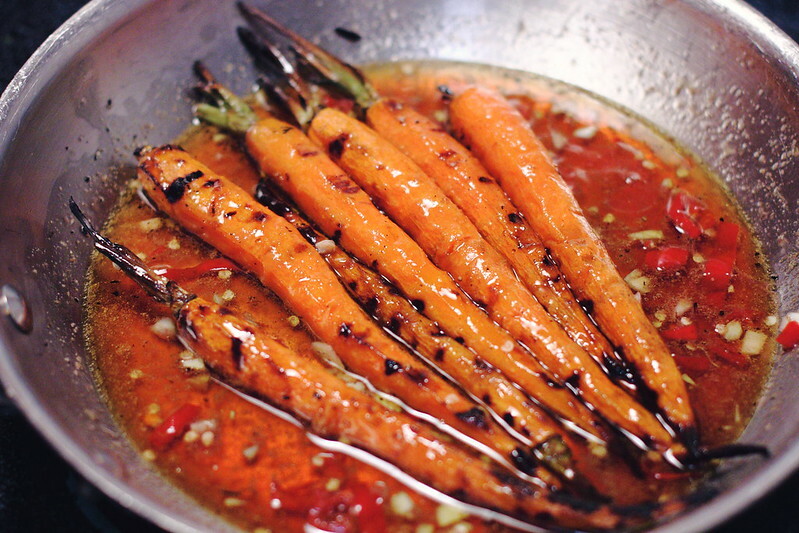 Lightly coat the carrots in olive oil and place them on medium-high heated grilled. Cook, turning regularly until lightly charred and just tender. Meanwhile, in a saute pan, combine the vinegar, chile, garlic, oil, honey, cumin, and salt to taste and heat over low to medium-low heat. While carrots are still warm, transfer them to the pan with the honey mixture, toss to coat, and cook until the vinegar has evaporated and the carrots become sticky and shiny. Serve warm and enjoy! this is recipe magazine/cookbook perfect!!! yummy! Fish can be a challenge – especially since I'm most apt to want to fry it. But this dish looks both tasty and healthy. Oh my gosh. This dish looks amazing! This looks amazing! I love salmon-definitely trying!